Are Mystery Novels An Endangered Species? I love to read mystery and suspense novels as well as to write them. Lately, I’m sensing a problem with the genre. TECHNOLOGY! Will technology be the end of the good old-fashioned mystery novel? I hope not, but it certainly means changes are coming. 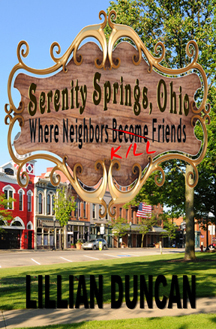 I’ve been working on updating one of my older books (SERENITY SPRINGS, OHIO) so that it can be released as an e-book. I was shocked to see how current technology made for some sticky rewrites from the original story manuscript. Cell phones alone can change the whole dynamic of the story. I had one scene where one of the characters was needed to help in a hostage situation. In the original story, it took up almost complete chapter as police were alerted and hunted for the man. The tension built–will they or won’t they find him in time to save the hostages? But as I read the scene, I realized the man would have a cell phone. So that tense scene morphed into a few sentences of picking up a phone and waiting for the man to answer it. Sigh–not nearly as tense or exciting! So, instant communication definitely changes the way mystery/suspense novels are written, but that’s just the beginning. What about all the technology available to the forensic labs? And the computer geeks? If you watch CSI, NCIS, Bones, or a variety of TV shows, it looks as if crimes are solved by scientists–not by the police or an amateur sleuth? I admit it! I’m intimidated by all the crime-solving technology available. I almost feel as if I need to go back to college and take a class on forensics or several classes not to mention some computer hacking classes before I write my next novel. So, are mystery novels an endangered species or not? My gut says NOT. Crimes are committed by people (real or characters) and no matter how much science can help there will always be the human element. That human element is where we writers will find our stories. On the other hand, maybe I’ll start writing stories set in the sixties or seventies. Life was a lot simpler back then–and so was writing! Murder shatters the peace and tranquility of the idyllic village of Serenity Springs. It appears to be an open and shut case to Chief of Police, Matthew Travis. A troubled teenager at the scene covered in blood with the murder weapon in his hand is arrested. Unfortunately, as Matthew ties up loose ends, his once open and shut case begins to unravel as he discovers more suspects with better motives. ← What is Christian Fiction? Congratulations on another book, Lillian! I look forward to reading this one! Thanks, Joy. That’s very sweet! Lilian, you are so right. I ran into the same problems with my suspense. I just had to work harder and study more. Sometimes old ways are best. Would love to win. That’s for sure and in more ways than just writing! As long as both sides benefit from the same technological advances, I don’t think the genre will change that much, other than reducing the focus on physical evidence — which the cops can deal with far more quickly — in favor of other types of evidence. Sleuths with powers of observation, deduction, and moxie can still figure out what happened. Readers of Robert Parker’s Spenser novels might remember a theme that recurred several times.The lead character, an ex-cop turned PI, would tell his clients that he couldn’t do anything better than the cops, but he could do it full time. Simple was easier, but it behooves us to keep up, I guess. As a mystery writer, the technology is almost more than I can understand so I need to develop resources to learn how it’s done in this computer savvy age. Thanks for giving me something to think about. I’d love to read another one of your books. I agree–it just means we have to think it through more and come up with viable plots. Thanks. Your comments were interesting. Now I am wondering how you handled the changes! I would enjoy a copy of your newer book! I hope you win, I usually just put the names in a basket and pick so that it’s fair. I’ve wondered about this myself. Modern convenience can make it more challenging to get our characters into seemingly impossible-to-resolve situations. It also means we need to get creative to accommodate all those things. It’s true even in other genres. It’s harder, for example, to justify a missed communication between two characters in a romance when all they’d need to do is pick up their cell phones, or Google something. Crazy world! That’s for sure. I found it really interesting how much had changed in a relatively short amount of time. Lillian, I appreciated your comments on technology and the mystery. I’m looking forward to what the future brings to the genre, but I miss the older ways. Makes one nostalgic for Maxwell Smart! Would love to win your book. I loved GET SMART! Thanks for commenting.